One more slight hiccup in Santiago, the long fingers of Iberia clutching at us as LAN initially couldn't find our internal flights after Iberia's update yesterday, but that was quickly fixed. Then it was a short flight and drive up to the Elqui Valley and its starry skies. The Elqui Valley hosts many of the world's best observatories due to the clear air, absence of light polution and the small matter of 320 cloudless nights per year. We visited Observatory de Pangue and got a fantastic tour of the night sky from the extremely knowledgeable Eric and his 40cm telescope. The southern skies really do look amazing. 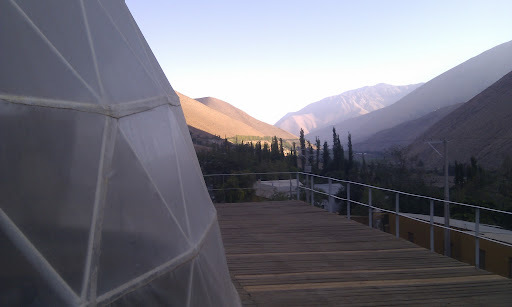 We stayed over night at the Elqui Domos, dome tents pitched high in the valley. You can open the tent top and fall asleep gazing at the stars, so we did.